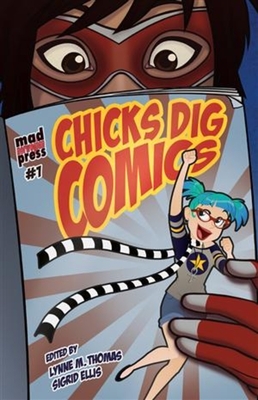 In Chicks Dig Comics, editors Lynne M. Thomas (Hugo-Award-winning Chicks Dig Time Lords) and Sigrid Ellis bring together essays by award-winning writers and artists who celebrate the comics medium and its creators, and who examine the characters and series that they love. Gail Simone (Birds of Prey) and Carla Speed McNeil (Finder) describe how they entered the comics industry. Colleen Doran (A Distant Soil) reveals her superhero crush, while Jill Thompson (Scary Godmother) confesses to being a comics junkie. Jen Van Meter (Hopeless Savages) sings the praises of 1970s horror comics, and Seanan McGuire (the October Daye series) takes sides in the Jean Grey vs. Emma Frost battle.Other contributors include Marjorie Liu (Dark Wolverine), Rachel Edidin (Dark Horse Comics), Jill Pantozzi (Newsarama), Kelly Thompson (Comic Book Resources), and SF/F authors Sara Ryan, Delia Sherman, Sarah Monette, and Elizabeth Bear. Also featured: an introduction by Mark Waid (Kingdom Come) and exclusive interviews with Amanda Connor (Power Girl), Louise Simonson (Power Pack), Greg Rucka (Queen & Country), and Terry Moore (Strangers in Paradise).